Why just participate in the Great Ontario Salmon Derby; go in it to win it! Give yourself the best chance at victory by fishing the waters around Bluffers Park Marina. In 2014 three of the tournament’s seven winners landed their prized catch here. Two of them took home 2014 Toyota Corollas and the Great Grand Prize Winner drove away with a 2014 Toyota Tacoma 4X4–not bad for a day’s work! 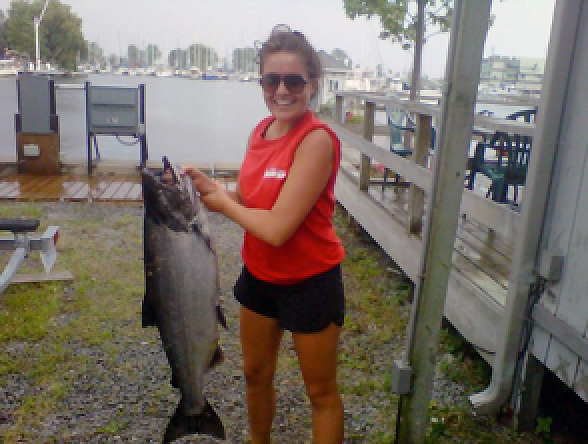 The fact is for five years in a row the biggest fish caught in the Great Ontario Salmon Derby have been pulled from the waters around Bluffers Park Marina–last year’s winner was an arm-aching 35.95 pounds! What’s our secret? For the past four years we’ve played a role in a very successful salmon pen rearing program. As a result the salmon come back to the waters of Bluffers Park Marina every year to spawn, making this location a true hot spot for salmon fishing during July and August when the Great Ontario Salmon Derby is held. With prizes in the 2015 Great Ontario Salmon Derby (July 4 to August 22) totaling over $450,000, give yourself the best chance at reeling in the big one. Remember, for the ultimate salmon fishing in Toronto, Ontario, you can’t beat the waters of Bluffers Park Marina. Tickets for the Great Ontario Salmon Derby can be purchased at Bluffers Park Marina and when you haul in that prize-winning catch you won’t have far to go to confirm it because Bluffers Park Marina is also one of the eight, official weigh stations for the Great Ontario Salmon Derby.